One of the most powerful determinants of the future success of your business is the little understood phenomenon of word-of-mouth communication. Fully 90 percent of dissatisfied customers will not do business again with the company that fails to meet their expectations. 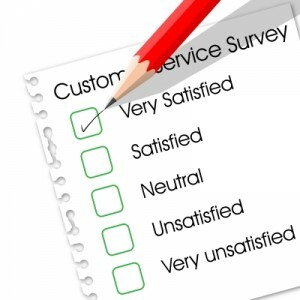 Plus, on average, each dissatisfied customer would share his or her dissatisfaction with at least nine other people. A satisfied customer, on the other hand, will share his or her delight or amazement with nine of his friends and relatives and associates, who will in turn pass the good news on to five others. In his book Word-of-Mouth Marketing, Jerry Wilson claims that the number of customers who will tell a positive story of their experience with you, your company or your product is one-tenth of the number who will share a negative story. In other words, while excellent customer service is essential in reducing or even eliminating negative word of mouth, you cannot rely on positive word of mouth to produce a stream of referrals. If you have done a good job of servicing your customer after the sale, you can be confident you now have a satisfied customer—one who will buy from you again and who represents a potential source of excellent referrals. Contact your satisfied customer and begin the conversation by inquiring if they are happy with their purchase and if there is anything more you can do for them. If they make a request, then treat this as a customer service call. If not, say to them, “I’m so pleased you’re enjoying your new (product or service). Can you put me in touch with anyone else who would appreciate the same experience that you are enjoying using it?” The wonderful thing about a highly satisfied customer is they often want their relatives, friends and associates to share their experience. Within one day or receiving the referral, drop a quick note to your customer, thanking them for their recommendation and again reassuring them that you will treat their friend with respect. This is an important part of cementing your relationship and will pay dividends in the future in the form of repeat business and further referrals. After you have followed up with the referral, be sure to call your customer. Again, thank them for the introduction and report your results. Remember, the referral is someone who is meaningful to your customer, so they will naturally be interested in what happens. A further way you express your gratitude and to reinforce your relationship with your customer is to send them a gift after you have closed a sale with a referral they provided. Your gift should be appropriate to the size of the sale.